The Cloud is a very popular buzzword these days and with all the companies offering up the cloud to consumers it can be confusing what it really is. The cloud can be very helpful to users who want to backup their data, or transferring files. The cloud is a remote server room with tons of servers that host all you files and applications. There are many free cloud services web applications that you can use to backup your files securely to the cloud. 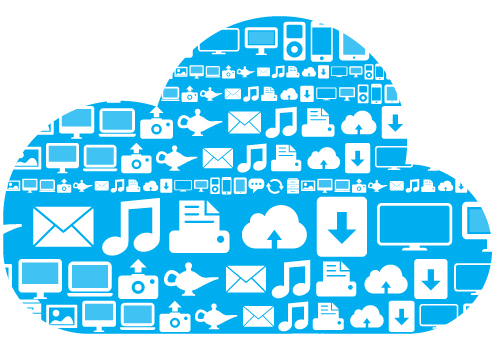 Here are several cloud services that I use and suggest to backup your data to the cloud. The first cloud service that I use all the time is Dropbox which is an application that works on all devices and lets you backup and sync your files to the cloud. Dropbox is a free easy to use cloud service that lets you access your files from any device. When you sign up for a Dropbox account you get 2GB of free cloud storage with your account, if that is not enough storage you can earn free upgrades but if you need a lot of space for your files Dropbox offers multiple tier plans starting at $9.99 per month. These plans start with100GB of storage and would be good for anyone who wanted to completely backup the computer or someone who is a photographer or designer. I have 5GB of free storage and the way I got the free upgrade is by installing Dropbox on my phone and choosing to automatically upload photos taken from my phone to Dropbox. This is a great feature that saves me time by not having to transfer photos to my computer over USB. If you are worried about using you data to backup the photos you can choose to only sync photos to Dropbox when connected to Wi-Fi. Dropbox works on all devices from Windows, Mac, and Linux computers to Android, and iOS tablets and phones. Dropbox is great for anyone who needs to access their files from many different computers and locations. This is a cloud service I recommend especially since it is free and easy to use. The next cloud service that I use is called Google Drive (formally known as Google Docs). Google Drive has been recently rolled out and is a replacement for Google’s Docs which allowed you to edit your documents right from the web browser. Google Drive is the next step up with its own app for Android and iOS. With Google Drive you get the same great features of with documents but you can now store all your files on Google Drive. This is good for people who already have a Google account because you get 5GB of free storage with your Google account. Google Drive is great for someone who needs to view and edit files on the go. Google Drive will let you view 30 different types of files, including Adobe Photoshop and HD video. It is especially nice since you don’t need the third party applications installed on the computer you are using. If you want to create your files inside of Google Drive you can create almost all Office documents. You can make a Document, Presentation, Spreadsheet, Form, and even a drawing right from the web interface or the app in Android and iOS. You can also make folders to organize your files by project or purpose. If you want to take a file out of Drive you can download it in many different formats for you to use on your computer. You can also choose to have your files converted from PDF to text and from Office file format to Google format. Google Drive also allows you to upgrade your account if you need more space. Their pricing structure gives you a lot of options with many different tiers. The first level is $2.49/month for 25GB, then $4.99/month for 100GB, and $49.99 a month for a whopping 1TB. You can upgrade all the way up to 16TB of storage space. If you move to a premium account it also automatically expands your Gmail storage to 25GB. I think Google Drive is a must get just for the free storage everyone gets for having a Google account. 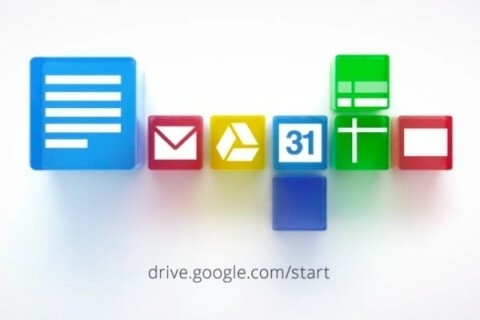 Google Drive is based more toward business professionals compared to Dropbox and each service offers different features. Google Drive has a great document editor in the browser and I recommend it for anyone who wants to access and edit their documents on the web or from a tablet or phone. 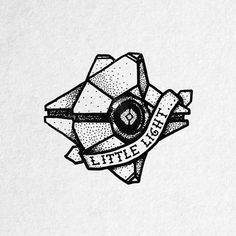 The last service that I use and it is not like the other two. 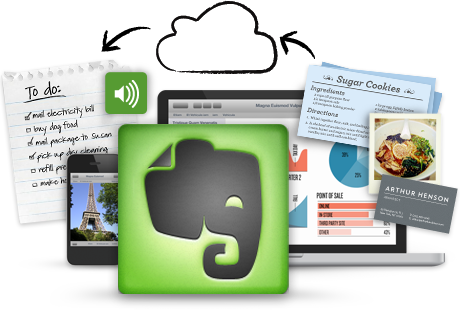 Evernote lets you make notes and access them from any device. Evernote lets you take pictures and audio and make them into notes that you organize into notebooks. You can then use the app on Android, iOS, Windows, or Mac to edit, view, and organize your notes. Evernote has a lot of add-ons you can use including a web clipper which lets you take parts of web sites and add them to notes. One of the best features for Evernote is the search which is powerful and searches your files quickly. Evernote will even search text inside photos you have taken and added to notes. This feature is great for recording and organizing receipts or recipes you have. The Evernote Android app has a great design and very easy to take a picture, create a note and view all your other notes. I use Evernote free and I recommend trying Evernote to see if it can help you store notes, receipts, or anything you need to store. Evernote has a great app on Android and iOS and should be considered when looking for a service to store important information you need.